A fit-for-purpose sharing architecture is one of the fundamental elements that underpin a secure and performant Salesforce implementation. The sharing architecture defines the record-level visibility model and should be subject to periodic review and refinement to reflect shifting organisational factors. The most efficient sharing models make full use of implicit sharing via the Role Hierarchy, with minimal use of explicit techniques such as Sharing Rules. An implicit model is reliant on a well conceived Role Hierarchy that reflects data access across the organisation, and is therefore not necessarily aligned directly to the organisational structure. This is hard to achieve and requires an approach of continual adjustment throughout an implementation project and beyond. The benefits of this approach are manyfold; control, reporting, maintainability and performance being just examples. In regard to control, implicit access provides the record-owner level of access, which can’t be achieved via explicit means. With reporting, the dynamic filters “My Team’s Accounts” etc. are based on the Role Hierarchy, i.e. users in roles below the current users’ role etc. in addition with some reports the Role Hierarchy can be used to filter the output at runtime. In regard to maintainability, the proliferation of sharing rules often introduced to compensate for a substandard Role Hierarchy design is avoided. Finally, in the performance case, although sharing data (AccountShare etc.) is persisted at the time of configuration, and not calculated fully at the time of record access, there is still a performance consideration with complex sharing models. So in short, a sharing model that is predominantly implicit is better than an explicit model. Irrespective of whichever model is implemented, a comprehensive understanding of the explicit techniques and their primary use cases is important to ensure the sharing model is appropriately secure and maintainable. For the first time in a number of releases, the Spring ’15 release introduces a new sharing model feature “Manager Groups”. 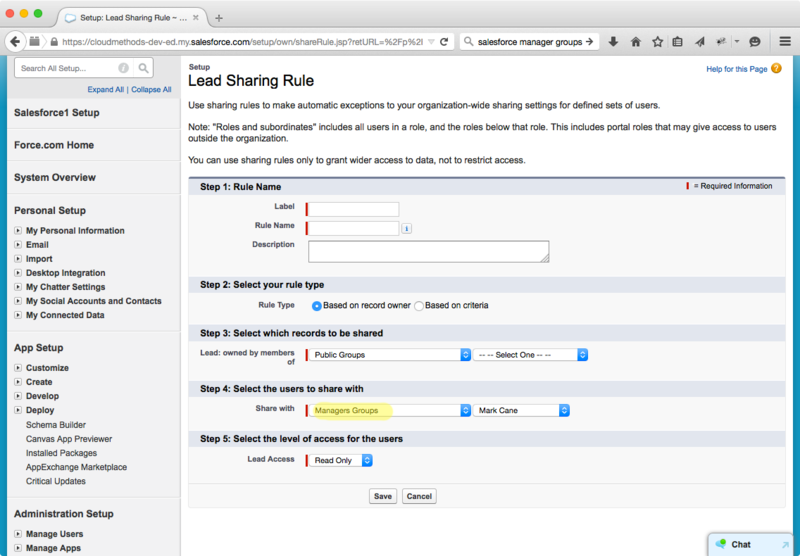 This feature extends the capability of explicit sharing techniques (Manual Share, Sharing Rule and Apex Managed Sharing) enabling direct use of the management hierarchy, as defined by the Manager field on the user record. Manager Groups are system defined, per-user, and can be utilised in the same way Public Groups are used in the same contexts. For each user 2 Manager Groups are provided; “Managers Group” – immediate managers and their manager and so on (up the management hierarchy) and “Manager Subordinates Group” – the user’s direct reports and their reports and so on (down the management hierarchy). 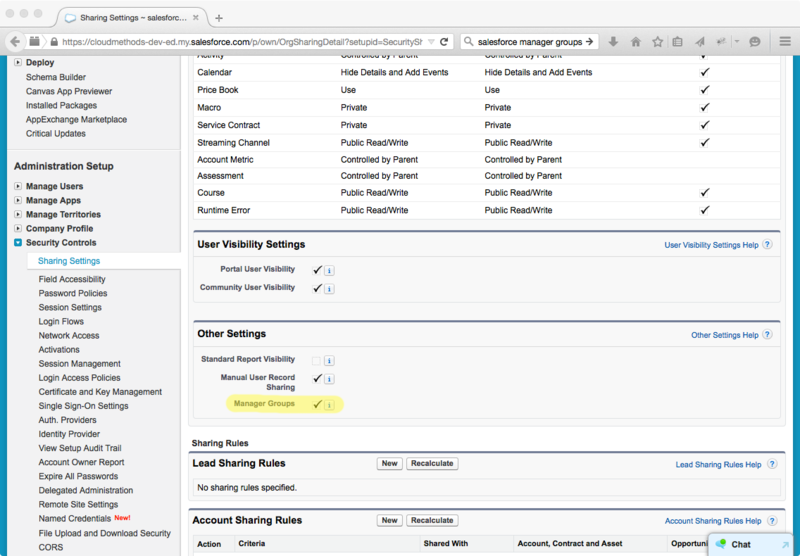 Unlike Role Hierarchy based sharing, Manager Groups share directly to each user in the hierarchy chain, not all users with the parent role. 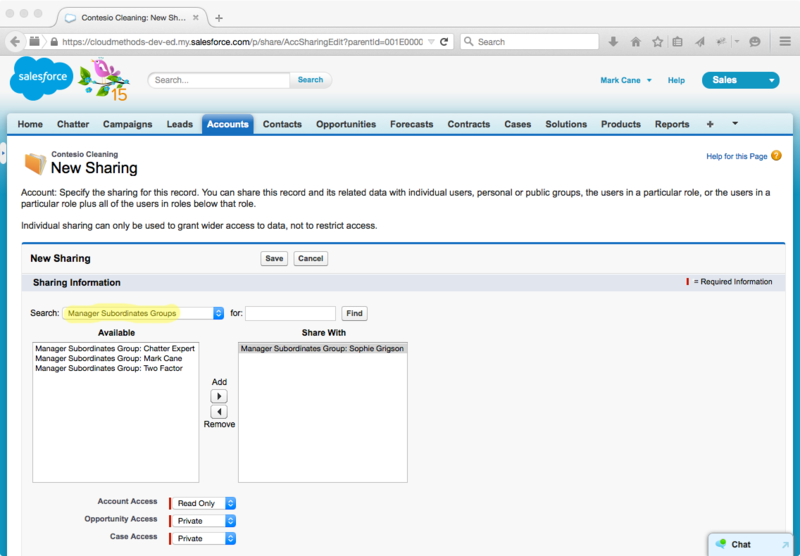 Note, the Manager Groups feature was initially introduced in the Winter ’14 release and made available upon request. Spring ’15 makes the feature automatically available in all orgs. Prior to the introduction of Manager Groups, sharing based on the management hierarchy relied upon the Role Hierarchy reflecting the management hierarchy, or elaborate explicit means. The Manager Groups feature now provides an efficient means to share data up and down the management hierarchy, leaving the Role Hierarchy to strongly model the data access requirements for the organisation.